Hi there! My name is Lisa Danielson. As the head nutritionist here at IdealRaw and as an ISSA Certified Specialist in Fitness Nutrition, my job is to help people look and feel their best through nutrition and exercise. If your stomach is having troubles, you’re going to have a hard time feeling your best. Poor diet, illness, and even environmental factors like pollution can negatively affect the way our stomachs function. Our stomachs are homes to over 500 different species of living microorganisms that work together to keep our bodies in balance. These microorganisms (aka probiotics) help in the absorption of nutrients and vitamins, assist in the strength of intestinal cells, and even keep our immune system healthy and active. But since we all get sick, or eat poorly at times, those good bacteria get reduced. The reduction of bacteria in our stomachs can lead to loss of energy, weight gain, excess gas and bloating, diarrhea, and other tummy troubles. But don’t worry, because there is a way to restore balance. If your gut isn’t functioning properly, your body misses out on the nutrients it needs. That’s why it’s so important to make sure you have a healthy amount of good bacteria in your stomach. These good bacteria help absorb many essential vitamins and minerals your body requires, as well as make up a major part of your immune system. And IdealRaw Probiotic doesn’t just give you probiotics, it provides your stomach with everything the probiotics need to do their job. 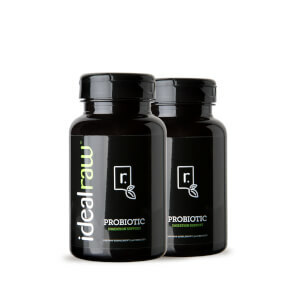 With its high amount of probiotics and everything they need to keep them alive and strong, IdealRaw Probiotic is a perfect way to assure that your gut, and you, get everything you need. Save on IdealRaw Probiotic Today! Probiotics are live microorganisms (aka healthy bacteria) that assist in regular digestion and processing in the digestive system. They have been shown to aid indigestion, ease occasional bowel issues, improve immune function, and fight against the effects of harmful bacteria. Healthy gut bacteria can be damaged or destroyed by, antibiotics and the western diet. By taking a probiotic, you replenish these healthy bacteria back to your intestinal tract for proper digestive health. How often do I take this probiotic? When should I take it? Take 3 capsules a day. Probiotics should be taken in the morning or at bedtime. During these times, the digestive system has little activity, which means the pH of the stomach is relatively low. A less acidic stomach means the bacteria have a higher chance of attaching to the intestinal wall and being beneficial. If you do happen to notice any stomach discomfort while taking IdealRaw Probiotic, try starting with one capsule and gradually increase the amount until your stomach gets used to the probiotics. 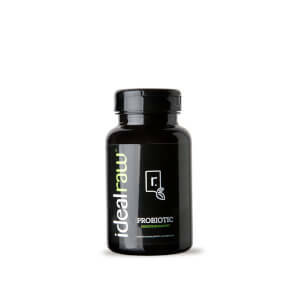 How many CFU’s are in IdealRaw’s Probiotic? CFU stands for colony forming units and is a unit of measurement used to estimate the total count of bacteria within a culture. IdealRaw Probiotic’s 40 billion CFUs refers to the total count of bacteria from the eight strains used in a daily dose of three capsules. It’s generally recommended to have at least 10 billion CFUs daily. L-Glutamine is an essential amino acid found naturally in the body and also in both animal and plant proteins. It promotes digestive and brain health, muscle growth, and athletic performance. Acacia fiber is a soluble dietary fiber which helps soak up water as it passes through your digestive tract, helping to bulk up stools to prevent occasional constipation and diarrhea. Soluble fiber may also provide a feeling of fullness so you do not overeat. Jerusalem is a tuber which resembles a sunflower. It contains a high amount of inulin, which is a prebiotic. Inulin helps stimulate the growth of bifidobacteria which helps fight harmful bacteria in the intestines, may prevent constipation, and give the immune system a boost. 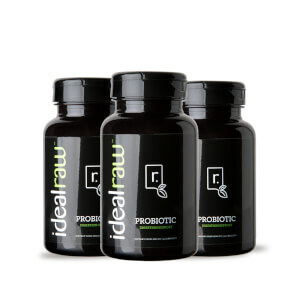 We are sure you'll love IdealRaw Probiotic. If you don’t, send it back within 1 year for a full product price refund. No hassle and no questions asked. It's that simple!